September 10, 2018 at 12:34 pm. — A quick check of the dictionary comes up with a lot of synonyms for the word “transgression” … error, misdeed, violation, wrongdoing … to name a few. And, it’s Biblical that believers can be removed from their transgressions, “as far as the east is from the west,” the good book says. You’ll find that in the 103rd Psalm. For sure, that Biblical reassurance was NOT referring to the East and West divisions of the Southeastern Conference, but from the look of things, it could have been. The giant chasm between the East and the West has been of near Biblical proportions for a while now, but if anything, it’s getting greater. And, divine intervention might be the only thing that could change that any time soon. Is there anybody that can challenge Georgia in its own division? It was supposed to be South Carolina. The Gamecocks return three-year starter Jake Bentley at quarterback and have the SEC’s most explosive scoring threat, Deebo Samuel, back after a season-ending injury a year ago. Their 2017 team was among the Top 25 nationally in scoring defense. So, maybe they could pull off the upset this year at Williams-Brice. When they played on Saturday, that myth lasted 43 seconds. That’s how long it took the Bulldogs to score their first touchdown on a pass interception. A little over two minutes later, the score was 14-0 after D’Andre Swift scored from 17 yards out. The Gamecocks never got closer than a touchdown, losing 41-17. How dominant were the Dawgs? They rushed for 271 yards; Carolina had 54. Georgia had 11 more minutes with the ball than the Gamecocks. If not South Carolina, then who … Florida? It took new head coach Dan Mullen just two games to end 31 consecutive years of Florida winning over Kentucky. Playing in Gainesville, the Gators led the Wildcats 10-7 at intermission, then were outscored 20-6 in the second half in the 27-16 loss. Before Saturday, the last time that Florida lost to Kentucky (1986), Mullen was quarterback of the Trinity High School Pioneers in Manchester, New Hampshire. Was this one a fluke? Not hardly. The Wildcats had 303 rushing yards with two 100-yard rushers (running back Benny Snell, quarterback Terry Wilson). Wilson also passed for 151 yards and two touchdowns and ran for a score. The Cats were successful on nine of 13 third down conversions against the Gator defense. Tennessee, the team that was demolished in the season opener by West Virginia, 40-14, when the Mountaineers outgained the Volunteers by about 250 yards. Tennessee won big on Saturday over East Tennessee State, but what does that tell us? This week it’s UTEP with its 0-12 record from 2017. The following four games will tell the story for the Big Orange … Florida at home, at Georgia, at Auburn, Alabama at home. Doesn’t sound much like a contenders’ schedule to me. Missouri, the team with possibly the SEC’s most high-powered offense, put 51 on the scoreboard in Week 1 against UT-Martin, then scored 40 in the win over Wyoming. Next Saturday’s test versus Purdue probably won’t reveal much either. The Boilermakers lost at home to Central Michigan on Saturday. After that, it’s Georgia, South Carolina and Alabama in a row. Check back then on the Tigers. And, there’s Vanderbilt. The Commodores sit at 2-0 with wins over Middle Tennessee and Nevada by an average score of 39-9. Check on the ‘Dores after next Saturday when they travel to South Bend to play No. 8 Notre Dame. A good showing there and Vandy could be considered the second best team in the East. But, what does it say about your division if Vandy is its second best team? Things are much different in the West. In this week’s Associated Press poll, four of the top 16 teams are from the SEC West … No. 1 Alabama, No. 7 Auburn, No. 12 LSU, No. 16 Mississippi State. Texas A&M finished just 14 points outside the Top 25 at No. 27 and Ole Miss also received votes. Georgia is the only SEC East team ranked (No. 3). Auburn has already beaten then-No. 6 Washington, the Pac-12’s best team. LSU has already beaten then No. 7-Miami; Mississippi State won comfortably at Kansas State; and, Texas A&M barely lost to No. 2 Clemson, 28-26, after a late unsuccessful two-point conversion attempt. At this point, the seven best SEC teams are Georgia and every team in the Western Division except Arkansas. Unfortunately for fans in the East, this is nothing new. In the decade since Florida won the 2008 national championship, there have been 10 appearances in the national championship game by SEC teams – Alabama (6), Auburn (2), LSU (1), Georgia (1). That’s nine for the SEC West; one for the SEC East. And, that one SEC East team (the Bulldogs) lost the title to an SEC West team (the Tide). 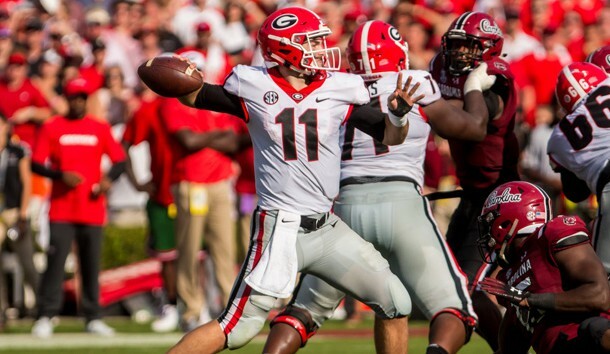 Of course, there’s still hope for the SEC East, at least on paper if not on the field. Those teams primarily get to play each other, a blessing compared to the dominating SEC West where ranked teams face off every week, sort of like gridiron cannibals. A national analyst was asked after this past Saturday’s games if the SEC’s Eastern Division teams had a chance to be competitive with SEC West teams any time soon. “Not a prayer,” was the reply. On second thought, with as far as the East is from the West right now, that may be their only chance.